All transactions are safe and secure with a reliable history in online purchasing behind each of our associates. 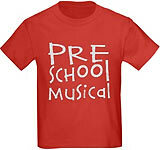 Buy the Pre School Musical t-shirt to own High School Musical clothing and merchandise. These cute High School Musical tees are perfect for the little performer in your family. The front of the tee reads, "Pre School Musical". Choose from a handful of shirt colors, including royal blue, navy, red, and black. The design on this High School Musical merchandise item is also available with orange lettering on white and other light colored Ts. In addition to the Pre School Musical tee above, browse the High School Musical Clothing Gallery for more apparel like men's and women's clothes, kids shirts or hoodies.